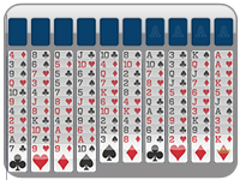 Free Cell is based on solitaire and played with one full deck of cards. This is a skill game, as it possible to win almost every Free Cell game. 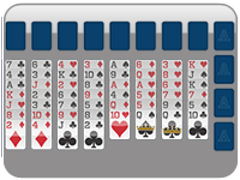 Play in Free Cell begins with eight tableaux which include all playable cards, four foundational spots, and four open cells. Cards may be moved in and out of the free cells. The Free Cell foundations are built by suit, Ace through King. 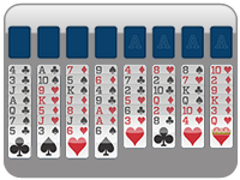 You may move cards around within the tableaux, but piles must be built downward by alternating black and red cards. Move all cards into the foundations and you are the Free Cell Champion. 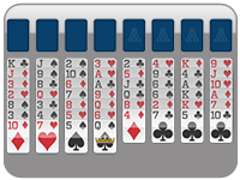 Card Game Freecell.com offers many variations of FreeCell, including Basic FreeCell, Baker's Game, Eight Off, and Double FreeCell. Try them all today!